Rolla bolla are a classic circus prop. Great for developing balance. Once you got the hang of it you can start working on other tricks. 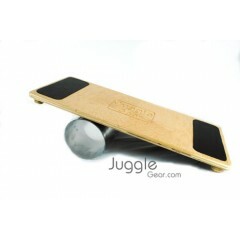 Our rolla bolla boards are very strong and you would have to use it inappropriately for it to break. The top side has rubber grips, with the aluminum rolla.